A long time ago (in a galaxy far, far away) you had to wait for the valves to warm up after you switched the TV on. In those days BBC tv broadcast a lunchtime news bulletin, Watch With Mother and, from certain transmitters, a programme in Welsh, then promptly closed down again until about 4.30 in the afternoon. 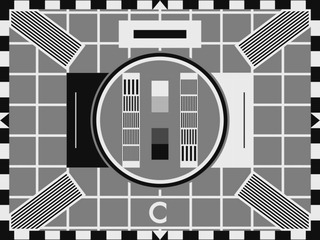 The rest of the day, from 9.00am, was devoted to trade test transmissions consisting of the Test Card and 'some music'. Some might argue, myself among them, that GMTV, 'Good Morning with Whoever' and 'Can't Think, Won't Think' are hardly progress from those happy, carefree innocent days of our youth, but that's another story. It's worth remembering, though, that at that time there were very few households that would contemplate switching the television on much before 5.00pm. Most people remained sadly unaware that their television had a sort of 'secret life' and that lots of bright, jolly music was being broadcast, virtually uninterrupted, each and every weekday. After all this time (and we're talking mid-sixties here) I'm not exactly sure now how it was that I came to latch on to it, but as I child I was always interested in how electrical things worked, so for me television held more than the usual fascination with which it transfixes the young. I also couldn't bear to miss the beginning of anything, so I wanted to see not only the first programme, but whatever was on before that. Then, as I started to enjoy the music, I wanted to switch on earlier and earlier! You see, there was something else which drew me to the television speaker - the sheer quality of the sound. Before NICAM digital stereo very few people took tv sound seriously, but back then very few people had discovered VHF radio, and years of medium wave had conditioned us so that even record players which were, well, often horrible radiograms, sounded like they were buried under a pile of blankets. (This was usually described as a 'nice tone'!) But you couldn't mess with the tv sound, so if you had a reasonably good telly the test card music sounded rather good. Well, the school holidays came around, and when I got to grammar school I discovered someone else who liked the test card music and we were off, in a world of our own. As all test card music fans knew, it was impossible to find anything out about the tunes and you certainly couldn't buy them in the shops, so we literally didn't know what we were talking about! Fortunately my new friend had carefully noted the usual sequences that the tapes were played in so at least we had a code. There appeared to be six tapes in use on BBC1 at any given time, and another six on BBC2, making around 300 bits of music in all. We knew Chelsea Chick, for example, as 9A1. Real cognoscenti will know that the Third Programme also had similar tapes which were used during Test Match Special when play was interrupted or finished early. But what of the music? As you may remember the styles range from light orchestral through to big-band jazz. The recordings are mostly quite superb, and were actually chosen to provide an impressive sound, but the arrangements were the thing, with the music often scored for quite large orchestras, something which is becoming much rarer these days. This sort of music simply can't be afforded any more. Big music business names were behind these arrangements and performances, though they were sometimes recorded under pseudonyms - there was never an Oscar Brandenburg, for example, it was really Neil Richardson, Alan Moorhouse and Johnny Pearson. 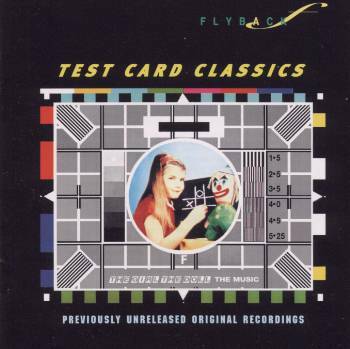 Test Card Classics vol.1 'The Girl - The Doll - The Music' brings 21 of our long-lost favourites together, many of them being heard in stereo for the first time. They were broadcast on BBC1 & BBC2 between 1966-1984. 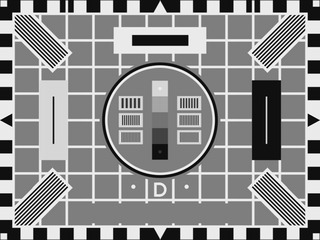 There is also an introductory announcement by no lesser luminary than John Ross-Barnard, a one-time continuity announcer for BBC2 who was, apparently, one of only two men to actually choose the test card music. The CD was compiled by Tony Currie & Lucy Reeve, both members of The Test Card Circle, and the fact that it is released on Chandos Records is no mere coincidence. Chandos is co-owned by Brian Couzens who produced many of these recordings, and even wrote one of the pieces (Holiday Highway)! My personal favourites are the recordings by the Stuttgart Studio Orchestra, which seem to have their own unique atmosphere, with Lark in The Clear Air just nudging ahead of the others. Volume 2 wittily titled 'Big Band Width' brings us 30 more gems, all with that Big Band flavour, some with strings too, and all in stereo. I know from the titles that most of these are firm favourites with Test Card Circle members, though I have to say that not all of them are familiar to me, though 'Apron Strings' (sadly the only Hans Hatter track), 'Beat In', 'Scotch Broth' and 'Fings Ain't What They Used To Be' make the purchase worthwhile! Steel yourself for the old-fashioned looks and order it from your local record shop soon. Even if you don't find yourself wallowing in nostalgia you'll discover your hi-fi speakers haven't sounded this good for a long time!